In hibernate; both merge() and update() methods updates an entity and can also affect the state of an object i.e. from detached to persistent. In this tutorial, we will explore the use of merge() method. 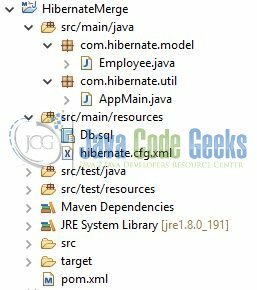 You can read this tutorial in order to download and install Hibernate in the Eclipse IDE. You can watch this video in order to download and install the MySQL database on your Windows operating system. Now, open up the Eclipse IDE and let us see how to implement this method in the hibernate framework! Here is a systematic guide for implementing this tutorial in the hibernate framework. We are using Eclipse Kepler SR2, JDK 8, MySQL database and Maven. Having said that, we have tested the code against JDK 1.7 and it works well. Firstly, let us review the final project structure, in case you are confused about where you should create the corresponding files or folder later! 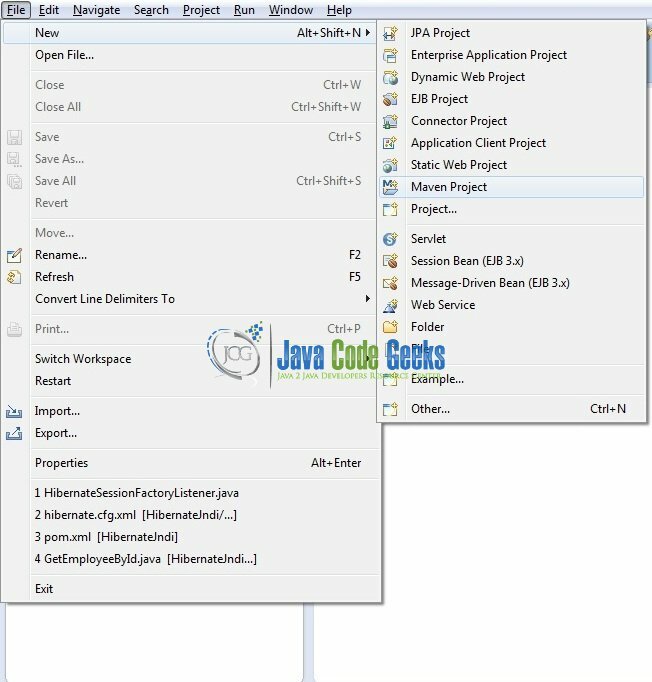 This section will demonstrate how to create a Java-based Maven project with Eclipse. In Eclipse IDE, go to File -> New -> Maven Project. In the New Maven Project window, it will ask you to select the project location. By default, ‘Use default workspace location’ will be selected. Select the ‘Create a simple project (skip archetype selection)’ checkbox and just click on the next button to proceed. We can start adding the dependencies that developers want like Hibernate, MySQL etc. Let us start building the application! Below are the steps involved in developing this application. The following script creates a database called mergequerydb with a table: employee. Open MySQL terminal and execute the script. If everything goes well, the table will be created. 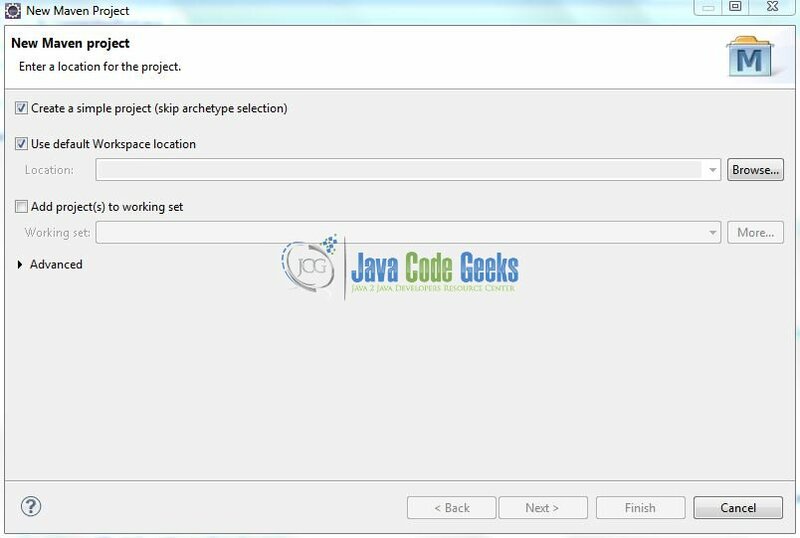 Let us write the Java classes involved in this application. Add the following code to the model definition to map the attributes with the column names. Add the following code to the implementation class for testing the merge() method. // Creating the config instance & passing the hibernate config file. // "emp1 is now a detached instance". // Closing the session object. In the configuration file, we will include the database and the mapping class details. To run the Hibernate application, Right-click on the AppMain class -> Run As -> Java Application. Developers can debug the example and see what happens after every step! The code shows the following logs as the output of this tutorial. 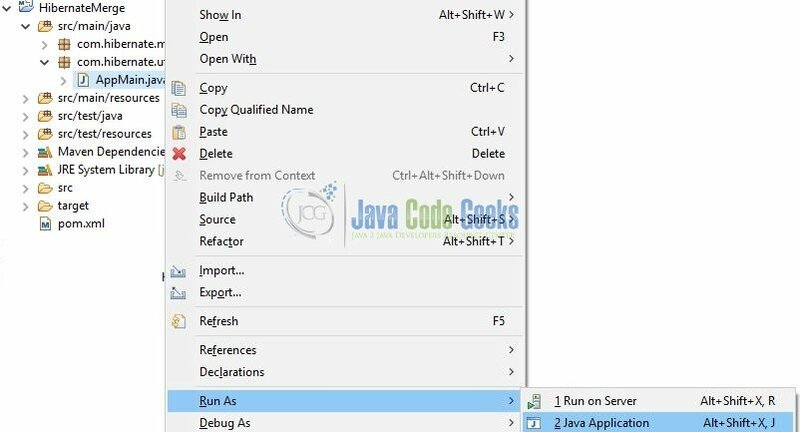 INFO: HHH10001501: Connection obtained from JdbcConnectionAccess [org.hibernate.engine.jdbc.env.internal.JdbcEnvironmentInitiator$ConnectionProviderJdbcConnectionAccess@2a3a299] for (non-JTA) DDL execution was not in auto-commit mode; the Connection 'local transaction' will be committed and the Connection will be set into auto-commit mode. Hibernate: select employee0_.id as id1_0_0_, employee0_.department as departme2_0_0_, employee0_.designation as designat3_0_0_, employee0_.name as name4_0_0_ from employee employee0_ where employee0_.id=? This post defines the implementation of the merge() method in the Hibernate framework and helps developers understand the basic configuration required to achieve this. Developers can download the sample application as an Eclipse project in the Downloads section. 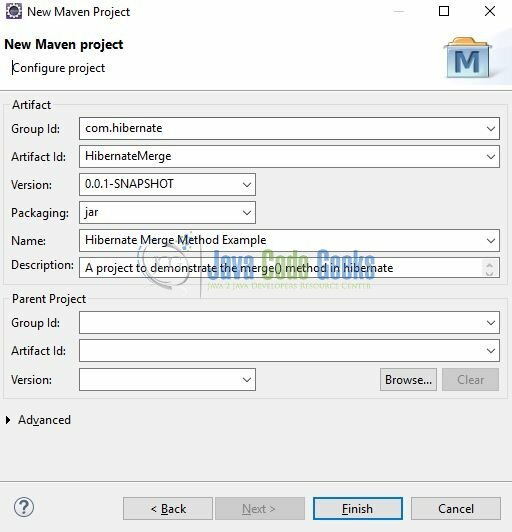 This was an example of the Hibernate merge method for beginners.